While chopping capacity was the key driver behind the BigX’s development, Krone’s attentions have now turned to operator comfort. Richard Bradley takes a closer look at the firm’s latest wide-body forager. Undoubtedly Krone’s BigX self-propelled forager has found favour with some users for its ability to effortlessly devour crops, particularly in more unfavourable conditions. However, while its appetite may be great, the operating experience has not always been just so. The German firm’s narrow-body forager range, launched at Agritechnica in 2013, addressed a lot of this, standing out from the rest of its line up with new styling, improved cab and trick rear suspension. Four years on, and the wraps were taken off Krone’s updated wide-body BigX at its home show in Hannover. Three new models are available, with the BigX 680, 780 and 880 replacing the 700, 770 and 850 models respectively. Limited numbers will be available for 2019, with full availability in 2020. For now, the firm’s flagship BigX 1100 remains unchanged, and smallest wide-body BigX 600 model has been phased out. Building on user feedback, Krone says most of the changes revolve around improving operator comfort. The forager’s internals remain relatively unchanged. To find out more about the new, plumper looking wide-body models, we caught up with a BigX 780 in the rolling North-Yorkshire countryside. Under the Krone’s new panel work lies the same 16.16-litre Liebherr V8 engine as introduced in 2017 to BigX 700 and 770 models. The firm says the new motor has a 1,000 hour service interval, twice that of the previous MAN-sourced unit. Along with this, Krone says its torque curves allow the forager to better recover when a driver does get a little eager to push on down the row, clearly evident on the day. Despite looking a little cumbersome, the large panels are relatively easy to open, and provide good access to the beast which lies beneath. While full-length side panels may look a tad big and numb to handle, the use of assisted stays, rather than previous gas struts, makes opening and closing less of a struggle. They do also provide plenty of access into the engine bay. Another feature to improve maintenance access, the cab steps can now pivot out of the way of the forager’s main belt drive. For improved storage, the forager’s rear end now features two lockable compartments to hide tools, blocks and chainsaws to make sure no hedges or trees get in-between you and the next field. Fluid carrying capacity has also been reworked, with a third tank providing the option of running with more fuel or additive on-board. Use for the latter providing a total of 500 litres internal additive storage. While much is the same under its skin, including its six feed roller design and VariStream systems, Krone has revised several areas to speed up header and crop changes. Up-front, the parallel header attachment linkage has been swapped in favour of the roller frame as with the firm’s narrowbody machines. Krone reckons this system allows for quicker and easier attachment of headers. It also says, with the use of blanking plates, headers for wide- or narrow-body machines could be used to suit contractors running a mixed fleet of BigX machines. 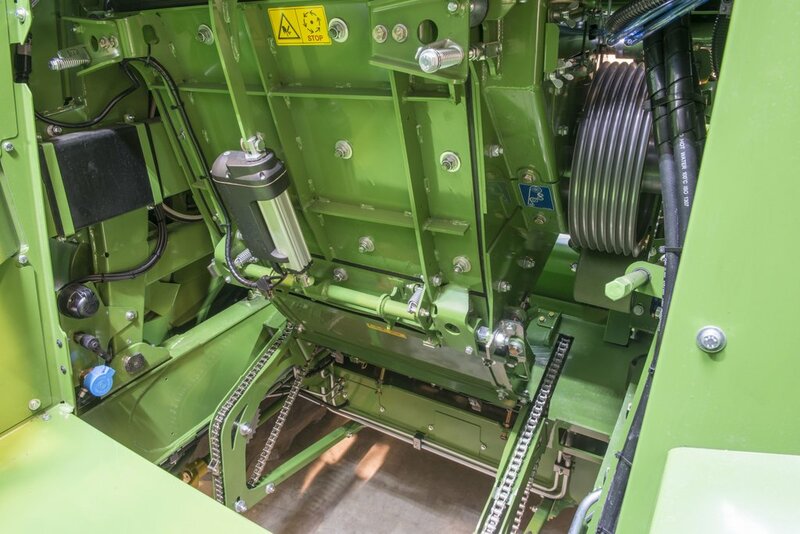 The manufacturer also says, to suit those who do not swap maize and wholecrop headers with every forager, it is looking to develop an adaptor system to fit existing headers to the new machines. The new quick coupler also allows the options of interlocking pto connector to be used along with hydraulic header locking pins, reducing the amount of time to switch between headers. The crop processor can now be disengaged without fully removing it from the machine, reducing downtime when changing between crop types. Another system to speed up operation when frequently changing between crops, the firm now offers a system to swap the grass chute and crop processor without having to remove it from the machine. To first install the crop processor, it needs to be wheeled under the forager on its service cart, with a mechanical conveyor picking up the processor and lifting it into the machine. The operator then has the option to either leave the processor in the parked position, or to remove the grass chute and fully engage the processor. Currently, this requires the operator to manually wind it in, although Krone is developing a remote in-cab system. Wishbone suspension offers a number of benefits, most noticably in ride quality and reduced turning circle. Along with fitting adjustable front wheel motors to maintain a level crop flow on different tyre heights, the solid rear axle has now been replaced by a wishbone suspension set up. This provides greater cushioning for better operator comfort, and allows sharper wheel turning angles, improving the forager’s manoeuvrability. Hydraulic rams are used to provide the cushioning effect, which also allows other useful features. To improve maintenance access the rear end can be raised to its highest position, handy for creating a larger space underneath the machine to wheel in the crop processor. Another benefit to getting rid of the solid rear axle, the forager’s engine and ancillaries can now be mounted lower down, reducing the bonnet's height towards the rear. Unlike the previous BigX this creates a hood which elegantly slopes away towards the rear rather than looking as if the engine is trying to burst out. It has however left behind a rather plump looking rear-end. One of the biggest talking points for the firm has been its cab, and in particular, its new party-piece. Available as an option, LiftCab allows the cab to be raised by up to 70cm (27.5in) to place the operator’s line of sight above towering maize crops. Along with reducing fatigue staring into endless walls of crop, the system allows operators to better see into trailers, to either end of large headers, and provides more room to get at the chopping cylinder. The cab itself has also seen some major revisions. A new control philosophy. The green rotary switch changes between working modes, with better labeled soft keys and touch screen looking after machine setup. In terms of control, most of the buttons and a new 30.5cm (12in) touchscreen terminal are now mounted to the seat’s armrest. Unlike the previous control set up, where buttons did not always clearly indicate their function, better labelled and backlit soft keys are now used. Another new feature on the armrest is a large master switch which allows quicker changes between modes such as work, road and servicing. To start chopping the operator only has to rotate the dial from road to work, fire up the chopping cylinder, fold out the header wheels and raise the spout. Each mode brings with it a slightly different page displayed on the new touchscreen terminal, and lights up the suitable soft keys to aid quicker recognition by the operator. The CCI1200 display also allows cameras to be displayed to suit operator preference, rather than having to fit a second screen. The cab looks good too, with a new black eyebrow wrapping the underside of the cab roof. And as if the existing lighting options were not enough, more LEDs can be fitted to turn night into day. Krone has clearly taken plenty of feedback on-board for its latest wide-body forager. Sitting pride of place, the new cab should make the BigX a much simpler and more pleasant place to spend endless summer months of chopping. For us, one niggle is its more rounded appearance. Almost as if it has settled into a long-term relationship, its waistline and rear end have plumped up, detracting from its previous aggressive and sharp image. However, its performance and new found comfort should let you settle in to it.